Hidden in the jungle covered hills, behind the town of Uvita, this 58 acre property sits on a gentle slope that borders the head waters of the Uvita river. This private property was used as a cattle farm but is nestled in primary rain forest with dramatic views of the surrounding mountains. The farm also enjoys a large area with white water ocean views and has over 500 meters of river frontage with many swimming holes making it perfect for a family compound, hotel or small development. The higher altitude offers a cool climate and steady breezes making this a perfect place to call home. 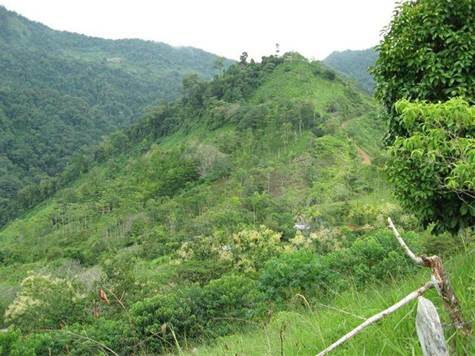 The farm is located roughly 20 minutes above Uvita on a road that is constantly improving and will most assuredly continue to improve as the area grows. Uvita has been steadily adding banks, restaurants and new stores helping to provide new services and help add value to the area and this farm. The local community is investing heavily in the Uvita area which is a great sign of things to come.